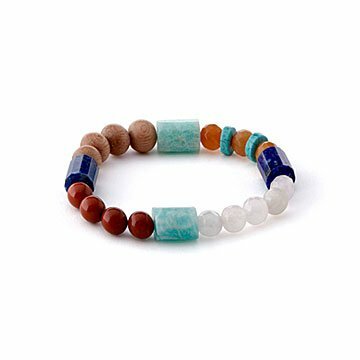 Wear aromatherapy (and a plethora of gemstones) around your wrist with this essential oil bracelet. Hippocrates once said, "The key to good health rests on having a daily aromatic bath and scented massage." Unlike Hippocrates, you probably don't have time for all those massages, but you can get a daily dose of aromatherapy with this essential oil diffuser bracelet. A colorful cast of gemstones makes it a fun way to accessorize any outfit, while the rosewood beads fill your day with delightful scents. Just add a drop of your favorite essential oil and you'll have a calming reminder of peace and serenity right around your wrist. Along with that collection of lovely stones, of course: rose quartz, amazonite, lapis lazuli, jasper, orange aventurine, and turquoise magnesite. Designed by Jennifer Bravo-Grulkey and made in New York. Apply essential oils directly to any of the rosewood beads. Roll bracelet on and off to avoid overstretching. Remove bracelet before showering, bathing, or swimming.